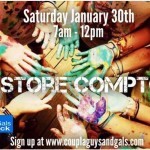 Coupla Guys and Gals is partnering with the Compton Initiative, a volunteer based non-profit organization founded in 1995 that seeks to beautify the City of Compton through quarterly initiatives that involve painting homes, schools, churches, parks, murals and other transformation projects. The belief is that the transformation of Compton must be fueled from within the city limits, with the help of the organizations, businesses and homeowners that reside here. Naomi hosts an annual Casino Night in Los Angeles. Its a night filled with fun and philanthropy. Naomi picks a foundation every year to benefit from all the proceeds of the night. This event is exclusive and invite only.